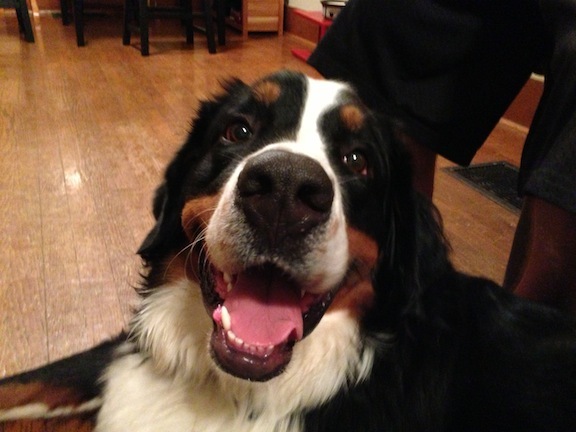 Moose is a one-and-a-half year-old Bernese Mountain dog. His owner had contacted me to help stop him from pulling on the leash. When I arrived to the appointment, Moose met me at the door and was very nosy, literally sticking his nose into my crotch and bag and showing zero respect for my personal space. To communicate that I wanted him to respect a ring of personal space around me, I stood up any time he violated this perimeter. Whenever I stood up Moose would quickly move away, but after taking a few steps he would circle back around as soon as I returned to a sitting position. I continued my initial conversation with his owners and also stood up to rebuke him every time he violated my personal space. After the fifth correction, Moose circled back around, but this time laid down in front of me about 3 feet away. Success! I explained to his owners that this is the proper way to disagree with Moose anytime he failed to respect their personal space. To dogs, standing is a much more authoritative position than sitting. By abruptly standing up anytime Moose invades their personal space, his owners will be able to communicate that they want him to respect and stay out of their personal space. There’s a difference between inviting a dog into your lap and a dog that constantly leans up on, or sits down in your lap without your invitation. Usually when a dog doesn’t respect it’s human’s personal space, it’s an indication of a dog that lacks respect for their authority. To correct that I demonstrated a leadership exercise that not only will help Moose see his humans as his pack leaders, but will teach him to self-restrain. It took a couple of repetitions, but Moose quickly understood what I was asking of him. As soon as that was the case, I coached his owner through the exercise as well so that she will be able to repeat it daily. By practicing this exercise every day for the next week or two while increasing the amount of time and difficulty of each repetition, Moose will quickly learn to respect his owner’s authority. Developing a healthy respect for his owners authority is crucial anytime you have a dog who fails to respond to their commands or acts out. Next I fitted Moose up with a Martingale collar and added my special twist to the leash. As soon as the lease was on Moose, his energy level went up. Once I noticed this, I had him sit so he could calm down and return to a balanced state of mind. Whenever a dog starts to show overexcitement before or during an activity, it’s always a good idea to give the dog a short time out. By asking the dog to sit and wait until its energy level falls before continuing, we are able to eventually communicate to the dog that the only way to move forward is when its in a calm, balanced frame of mind. It certainly takes some time, practice and patience, but I have yet to meet a dog who couldn’t figure that out. Once we got outside, I asked this owner to wait by the back door while I walked up and down the driveway to demonstrate the proper hand placement, positioning and corrections to use with the Martingale. For the first dozen steps or so, Moose was fighting the Martingale leash a bit, but after a dozen or so steps he fell right in line. I did have to offer several corrections to keep him in the heel position, but considering he had never really been asked to walk in that position before, his progress was impressive. I invited his owner over to take the leash and walked next to her as she begin the walk. As soon as she took the leash, Moose immediately started to pull on the leash, likely due to habit. At first Moose’s owner’s corrections were late and didn’t have the proper intensity level. But after a couple hundred feet, her timing improved as did Moose’s responsiveness to her. When I asked her if the Martingale seem to be making a difference, she told me that it was the most control she had ever had when walking Moose! In addition to the Martingale collar and leash set up, I offered a few additional pointers on how to get Moose to pay attention during the walk. By the time we returned to their home, Moose was walking next to his owner with slack on the leash. His owner mentioned how much easier it was to correct him any time he stopped or started to pull. I explained that once she finishes mastering the leadership exercise, Moose will be even more reactive to her wishes, commands and corrections. Because he is still a puppy and doesn’t have a lot of experience walking properly at a heel, it’s going to take some time and practice before Moose’s pulling stops altogether. However based on the amount of progress that we made during the 30 minute walk, clearly Moose can learn to change his leash pulling ways.